Lebanon Valley ran into a juggernaut in one of the best teams in the nation this weekend. No. 5 Delaware Valley showed why it's an NCAA Division III national-championship contender in a 35-0 Middle Atlantic Conference (MAC) victory at James Work Memorial Stadium on Saturday afternoon, Oct. 28. The undefeated Aggies (8-0, 7-0 MAC) flexed their muscle right out of the gate when tailback Devauntay Ellis broke off a 55-yard touchdown run on DVU's opening drive to put the home team out in front 7-0 less than three minutes into the game. The Flying Dutchmen (4-4, 4-3 MAC) flashed their defensive prowess when safety Zachary Adams halted Delaware Valley's next drive by picking off quarterback Dashawn Darden at the LVC 17-yard line and returning it 20 yards. The story of the game, however, was Lebanon Valley's inability to move the ball against the Aggies' defense. The Dutchmen were unable to pick up a first down in the first half after four three-and-outs and totaled just six yards of total offense. DVU on the other hand, had little trouble amassing points, adding a second touchdown on the second play of the second quarter to double its advantage. The Aggies' next possession also wrapped up in the end zone, this time after 10 plays and a 46-yard march. 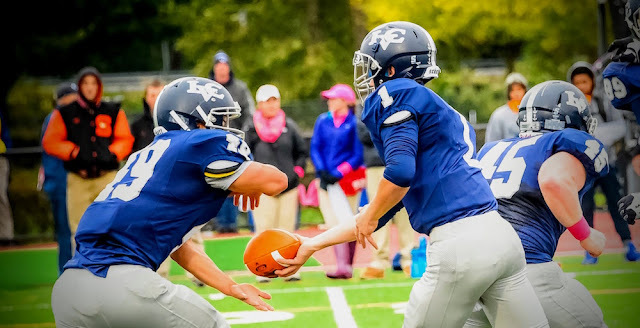 The backbreaker for LVC came when quarterback Tyler Sterner threw an interception on the first play of a drive that began at the team's own 38-yard line with 3:11 left in the second quarter. Del Val moved 43 yards in five plays and Ellis added another touchdown run, this one from five yards out, to cushion the advantage heading into the break. Lebanon Valley's best drive came midway through the third quarter but failed to net any points when the Dutchmen were stopped on fourth-and-1 at Delaware Valley's 43-yard line. Darden completed an 18-yard touchdown pass to Dan Allen with 13:19 left in the fourth quarter to cap the scoring, while the DVU defense kept LVC's offense from reaching the red zone the rest of the way to put a bow on the shutout victory. - Delaware Valley posted 433 yards of total offense, while the Dutchmen managed just 130. - Each team committed one turnover, with each squad tossing an interception. - Quarterback Tyler Sterner finished the game 5-12 for 63 yards, while backup Brett Cohen went 2-5 for 16 yards in a reserve role. - Running back Steve Salerno was LVC's leading rusher with 45 yards on 13 carries. - Wideout Tyler Sterner was the team's leading receiver, finishing with a pair of catches for 39 yards. - Linebacker Tim Schumacher was the team's leading tackler for the second week in a row, racking up nine stop and one tackle for loss. - Safety Anthony Jenkins forced a fumble but it was recovered by Delaware Valley. - Defensive lineman Tyler Conlon recorded one pass breakup. - Del Val tailback Devauntay Ellis was the game's star, finishing with 137 rushing yards and three touchdowns on 19 carries. - Defensively, the Aggies Christian Snowden made six tackles, including 3.5 tackles for loss and one sack. The Dutchmen return to the friendly confines of Arnold Field to host Lycoming for their home finale on Saturday afternoon, Nov. 4.